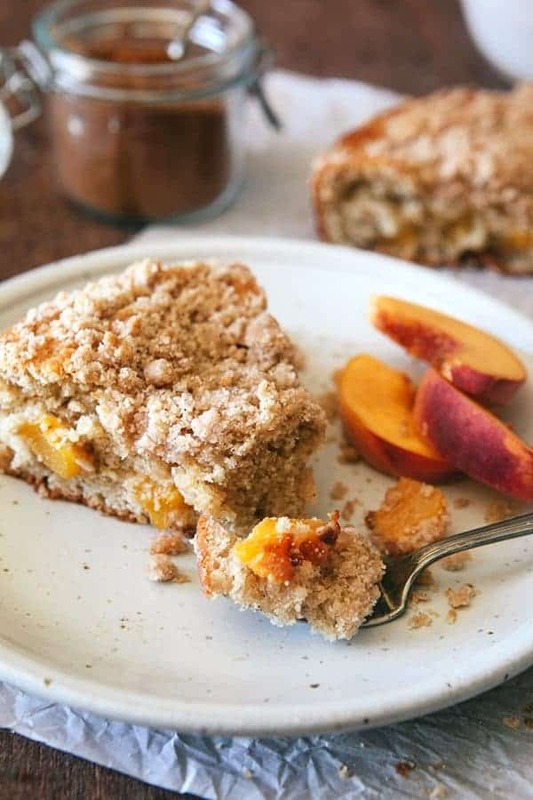 This Fresh Peach Coffee Cake is the perfect way to show off the season’s juiciest peaches. Whether you pair it with your morning coffee or save it for dessert, it will be hard to eat just one slice. I’m so excited to introduce you to our newest contributor, Allison from the blog Some the Wiser. She’ll be here everything sharing some of her favorite recipes! I hope you adore her as much as I do! Summer in our neck of the woods is unofficially over already. The kids went back to school two weeks ago and even the weather got the memo because the temperature dropped 15 degrees overnight. But just because the school already has us on a schedule, doesn’t mean I’m ready to give summer up just yet. The calendar still tells me we have a few more weeks of summer and the sun is still shining. I am planning to squeeze every drop of summer out of these last warm weeks that I can. Right now, maximizing summer means I’m really enjoying our last trips to the farmer’s market before it closes for the season. The best part of these final weeks of summer is that all the peaches are finally ripe! I’m bringing them home by the boxful because nothing says summer better than a ripe, juicy, sweet peach. Sticky fingers and sticky chins spell summer at our house. Peaches are my favorite summer fruit and you better believe I’m buying as many of them as I can get my hands on before the weather turns. Give me all the peaches! I’ve got Cherry Peach Bruschetta on the menu for lunch almost daily. And I have to get a few rounds of our favorite Peach Tarts in while we’ve got the fruit. The real show stopper this summer, however, is this Fresh Peach Coffee Cake. It’s the very definition of delicious! This coffee cake recipe evolved from an old recipe my grandmother has been making for years. Her coffee cake is always the best, never dry, never crumbly, and the perfect balance of spices and sweetness. But as perfect as her traditional coffee cake is, I knew that a juicy ripe peach could only make it better. 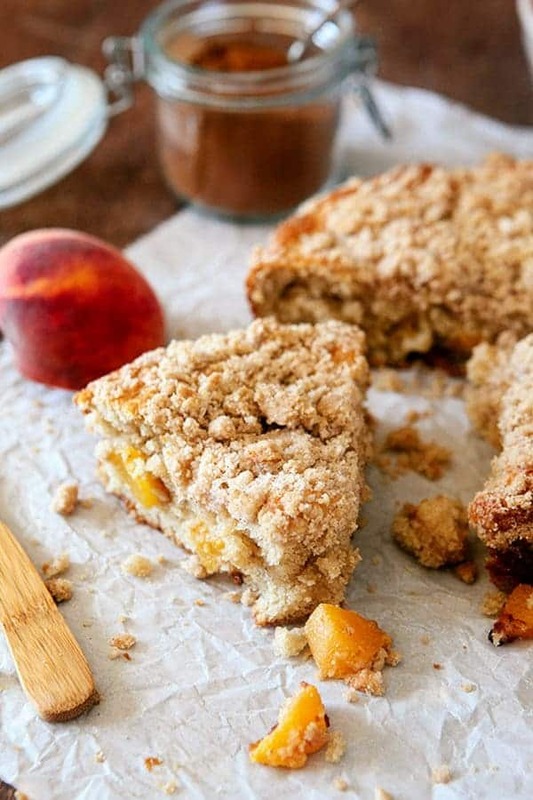 The secret for success with this Fresh Peach Coffee Cake recipe hinges on the peaches. 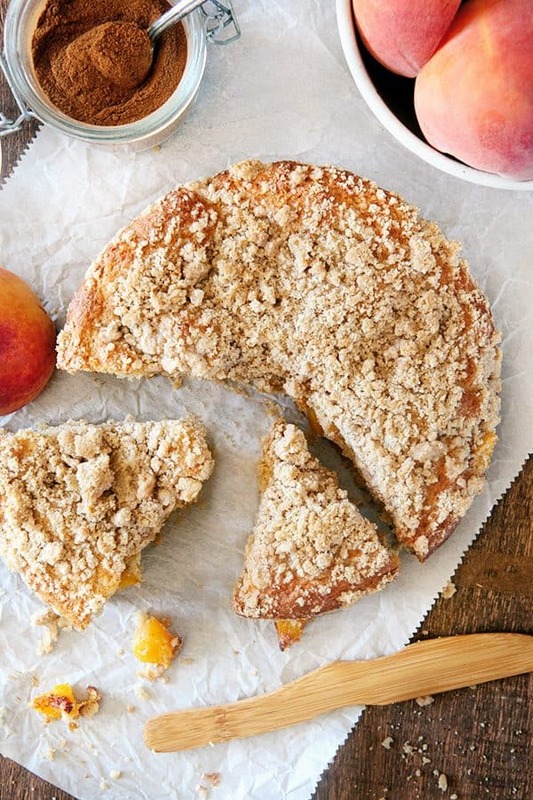 If you have really good peaches, this coffee cake will knock your socks off. The tender, sweet cake was good on its own, but when you fill it with chunks of ripe peaches and hint of cinnamon, it’s a pretty incredible combination of flavors. The peaches and I are sending out summer in style! I normally make this recipe in two 8 inch cake pans, which in theory means I end up with one Fresh Peach Coffee Cake to eat and one to share. But the combination of four kids in the house and the intoxicating aroma of fresh peach cakes baking in the oven means that the only thing we’ve had to share lately are a few crumbs. Really, it’s pure luck I even had time to photograph a slice before someone grabbed it. 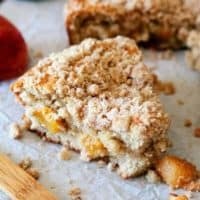 For more delicious peach desserts, be sure to check out these Peach Crumb Bars and Peach Crisp! Preheat oven to 350°F. Lightly grease two 8-inch round pans, or one 9×13 pan. Prepare streusel: In a medium bowl, whisk together the sugar, flour, cinnamon and pinch of salt. With your hands, work the softened butter into the flour mixture until it resembles a coarse crumble. Prepare cake: In a medium bowl, cream together the butter and sugar until fluffy. Add eggs, being careful to beat after the addition of each egg. Beat in yogurt and vanilla. Stir flour mixture into the wet batter until just combined – be careful not to over mix. Gently fold the peaches into the batter. Pour into prepared pan(s) and spread evenly. Top with streusel until batter is completely covered. Bake for approximately 30 minutes, or until toothpick inserted in center comes out clean. Cool for at least 15 minutes before cutting and serving. What a crazy delicious way to start the day or treat yourself at the end of a hard day! Yes! 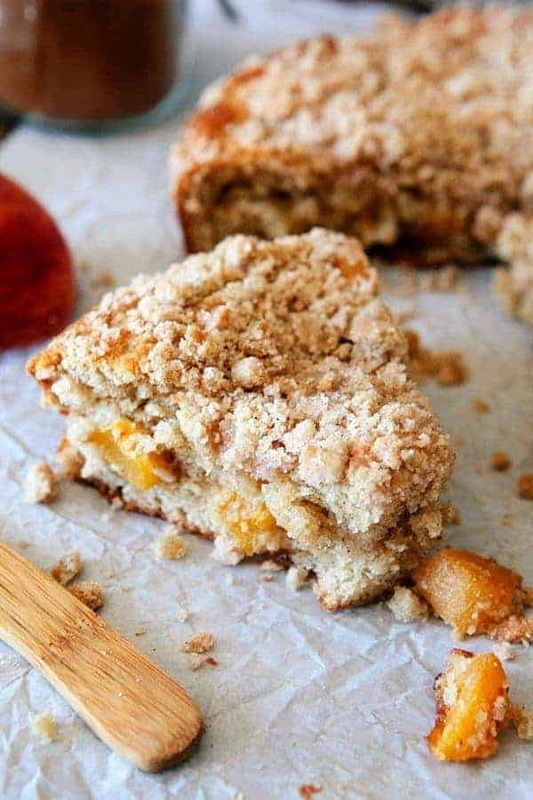 Well I have a weakness for peach pie….so this coffee cake I know I wouldn’t stand a chance around!! Hmmmmm, sounds delicious:-) Want to try this cake! I hope you enjoy it, Kali! WOW! This looks so fantastically nom!! Making this tonight. Could you please clarify the pan sizes. The instructions say two 8 x 12 pans or one 9 x 13. I think you mean two 8 x 8 pans? Sorry, Penny. Thanks for catching the mistake. You can use 2 8-inch round cake pans or 1 9×13-inch pan. I hope this clarifies things. Enjoy! I had so many peaches this year. I peeled,sliced & froze them. Was wondering if I can use them after thawing ? Hi, Nadine! You probably don’t even have to thaw the peaches; just use them frozen. Let me know how it goes! Hello! I was wondering if I can substitute any of the following for the yogurt; currently I have coconut milk, buttermilk and some heavy cream. Is it possible? If not that’s okay but I really want to make some now lol. I think the buttermilk would work just fine, Tiffany. Enjoy! I just made this and the house smells like heaven. 1. Don’t forget to add the spices to the dry ingredients for the cake. 2. I used 9×13 pan and increased cooking time to 50 min. I really hope you enjoyed it, Susan! Hi, Can I use Apple’s instead of peaches. Can you use canned peaches for this recipe when peaches are not in season? We have not tested this substitution, so I am not sure how it will turn out. I can recommend frozen peaches though. If you give it a try, let us know. Thanks so much for stopping by! Can you use a Bundy pan instead and put the strusel topping in the middle? Hello! I haven’t tried this recipe in a bundt pan, but if you do, let us know how it goes. Thanks for stopping by! Used cherries & almond extract. Don’t need the strusel topping in the middle. I made a glaze with cherry juice and used a bundt pan baked for about 55 minutes. It was quite tasty. So glad to hear you enjoyed it, Melanie! Thanks for stopping by to leave your feedback!